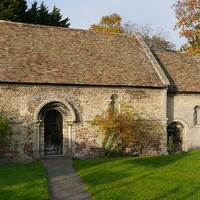 Home » News » Leper Chapel Open - Sat 6th April - tours & activities! Saturday 6th April Noon to 3pm Leper Chapel Open for FREE to public! Ever wanted to see inside the Leper Chapel? Please do come along if you are in Cambridge this Saturday and have a look around. Prof Helen Weinstein will be on hand to show you this unique hidden gem of Cambridge! Open Day at the Leper Chapel, with volunteers from Cambridge PPF opening the space for the public, and Historyworks team there to engage individuals and families with heritage and arts activities. Do drop by and see Hilary Cox Condron who will be making bug hotels, mapping your favourite places in the area, plus Mario Satchwell's geocaches trail will be explained and maps given out for individuals and families who want to explore the area afterwards on foot or on bycicle to find our other geocache locations.